​Ever thought of turning your passion into a successful career, and doing what you love on a daily basis? Or have you dreamt about becoming renowned in what you do and a leading authority in your field? Would you like to get some tips on how to potentially make this possible? Come and Hear Amanda Steele (Managing Director CBRE) and Cherie Barber (Australia’s Renovation Queen) share their pathways to success. Learn about the challenges Amanda and Cherie as business people have faced and the obstacles they have overcame to succeed. Amanda Steele is the Managing Director of Asset Services and GWS at CBRE, now responsible for over 1000 of our employees and servicing some of the world’s top occupiers. She has worked in sustainability and leadership roles for more than 15 years in Australia and internationally. Her work has had her interact with Prime Ministers, Vice-Presidents, real estate agents and everyone in between. Her career highlights include the amendment of taxation law to aid nature conservation covenants; establishing liveability metrics for a large property developer and assisting 4 organisations achieve listings in the Dow Jones Sustainability Index. 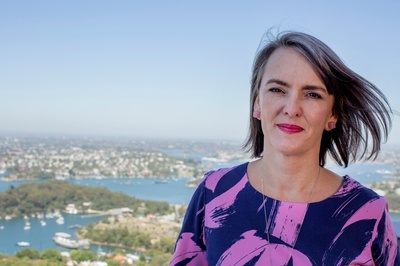 She had been awarded RICS Property Professional of the Year, sits on the NSW PCA Sustainability & Asset Services Committee, and the Green Star Steering Committee for the GBCA. She is a strong advocate for gender equality and social justice. Cherie Barber is Australia’s Renovation Queen™, one of the stars of Network 10’s The Living Room, a regular TV renovator on Network 9’s Today Extra show & Sky News Real Estate, weekly radio presenter, highly sought after public speaker, author, award winning business woman and the star of her own TV show in the United States of America called 5 Day Flip. At the age of 21, Cherie embarked on a minor renovation and cosmetically flipped her first property, making a profit in the process, that sparked her interest in property. She bought another unrenovated house straight after, and as they say, the rest is history. 27 years later, she’s now personally renovated over 105 properties to date. In 2009, Cherie established her company, Renovating For Profit, after constant requests from people asking how she did, what she did. She holds Australia’s largest community of renovators and more than 12,000 Aussies have undergone her training, This combined with her extensive media presence, make her Australia’s leading media authority on property renovation. She is considered by many to be renovation royalty, both in Australia and internationally. In addition to her significant renovation achievements, Cherie has been a finalist twice in the Telstra Business Woman of the Year Awards and in 2016, was named as one of the Top 100 Women of Influence in Australia. She is a national brand ambassador for Asbestos Awareness and is passionate about educating homeowners and DIYérs on how to renovate safely with asbestos.